Begging for contributions has been a tradition since Saint Jeanne Jugan founded the Little Sisters of the Poor in 1839. Collecting continues to be at the heart of our mission today. We believe that if we are faithful to our mission of caring for the poor, God will provide. Our benefactors are the instruments through which this is possible and we remember them every day in our prayers. Saint Jeanne Jugan went out daily to beg with basket in hand. In lieu of a basket, today we have a “begging van.” Our begging Sister contacts businesses and benefactors asking for whatever is needed to care for our Residents. 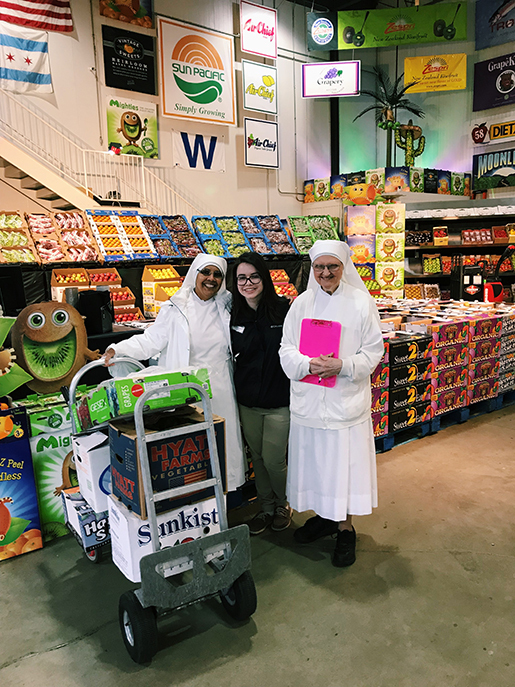 Every Wednesday, she travels to the wholesale markets in Chicago and asks for food and supplies. The Sisters also visit local churches and schools asking for donations. Our food and supply costs for St. Joseph’s Home are lower because of the outpouring of gifts we receive from business owners and individuals who give to special collections at area parishes. We are always looking for more food and supplies for our Residents.